PUTRAJAYA: Malaysia and the Philippines have agreed to establish a forward base at the border of the two countries to combat cross-border crimes. 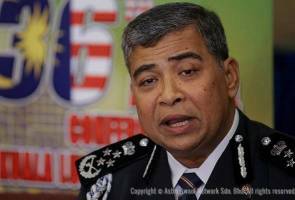 Inspector-General of Police Tan Sri Khalid Abu Bakar said he has discussed the matter with his Filipino counterparts. "We've agreed that this area needs to be focused on. "Therefore, I hope that with the establishment of this forward base, cooperation between the two counties on security matters will improve," he said. He was met after the closing ceremony of the 36th Asean Chiefs of Police (Aseanapol) Conference here today. Before this, numerous crimes had been committed at the Malaysia-Philippines border near eastern Sabah, with many of them being kidnapping cases mostly tied to the Sulu-based Abu Sayyaf militant group. Irwan Serigar, Khalid Abu Bakar, Dzulkifli Ahmad disenarai hitam Jabatan Imigresen?